Reiki (pronounced Ray-Key) is a Japanese technique for stress reduction and relaxation that promotes healing of Body, Mind and Spirit. Ki is the life force energy that animates all living things (the equivalent to Chi in Chinese). Ki gives life to every bone, muscle, tissue and cell of your body. The free and balanced flow of Ki is the cause of health. You are vulnerable to illness if your life energy is low or the flow is restricted. This restriction could had been years in the making (as in chronic illness) or could have occurred very quickly (as in acute illnesses or accidents). Learn more about the The Human Energy System. Reiki accelerates the body’s natural ability to heal physical ailments and opens the mind and spirit to the causes of disease, disharmony and pain. Reiki loosens blocked energy and allows the body to reestablish its natural equilibrium. 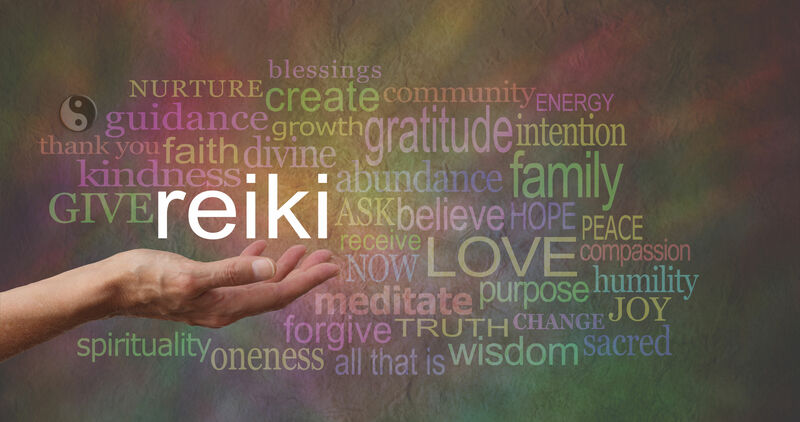 Reiki can provide a deep sense of relaxation, reduce stress, accelerate healing, facilitate the relief of pain, work with original cause, assist the body in releasing toxins, lessen the affects of chemotherapy and radiation, or remove negative blocks. In fact, because the Reiki practitioner channels energy from the universal source, there is no limit to what Reiki can do. Anyone can transfer energy to another person. What makes Reiki different is the “Placement” received in a Reiki class, “Igntion” in a Master class (previously called Attunement). During the Placement or Ignition adjustments are made in the student’s energy pathways to accommodate the ability to channel Reiki and further open the student to the universal source. Then the student need only intend that the Reiki flows, and it does – effortlessly. It is that simple, yet amazingly effective. Reiki may also be used for self-treatment. Once you are attuned to Reiki, you are able to channel the healing energy for yourself at any time, simply by your intention. You may reduce your stress or anxiety, relieve pain, etc. Once again, the possibilities are endless. Many people have the misconception that one session will eliminate all of their problems. In reality, people do not get the way they are in one day. If your physical body is out of shape, you do not change everything with one trip to the gym. So, too, with your energy body. Like any chronic disease or condition, it may take time and a number of sessions to bring the body back to balance. This is the main reason Reiki practitioners encourage their clients to take Reiki training so they can give themselves Reiki every day. Reiki does not interfere with traditional medicine or treatments but enhances the effectiveness of these methods.